Home / News / Spinrite Acquires Coats & Clark Inc.
Spinrite Acquires Coats & Clark Inc. Leading producer of yarn Spinrite diversifies offering with purchase of the North American Crafts business of Coats. The Canadian based craft yarn company is still closing the deal, but will absorb prestigious craft brands such as Red Heart, Coats & Clark, Aunt Lydia, and Susan Bates. This means Spinrite will be able to offer sewing thread, embroidery thread, trims, and zippers outside of knitting yarn. 560 employees of Coats will also become a part of the Spinrite team along with manufacturing and distributing centers in Albany, Toccoa and Douglas, Georgia. Coats, known as the world’s leading distributor of industrial thread, has offices in 50 countries across six continents and employs over 19,000 people. Other industries they operate in include footwear, automotive, medical, and more. As for their specific brands that will join the Spinrite roster, Red Heart is known for yarn, Aunt Lydia for crochet thread, Susan Bates for craft tools, and Coats for yarn, embroidery thread, and zippers too. 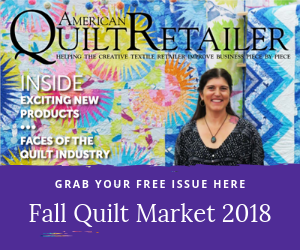 Stay tuned to the American Quilt Retailer blog to find out about industry news including acquisitions, events, and more.